What if you could double the click-through rates of your social media updates? Extra traffic from Facebook, LinkedIn andTwitter would be nice, right? In this article you’ll discover four steps for crafting a great call to action that improves click-throughs. 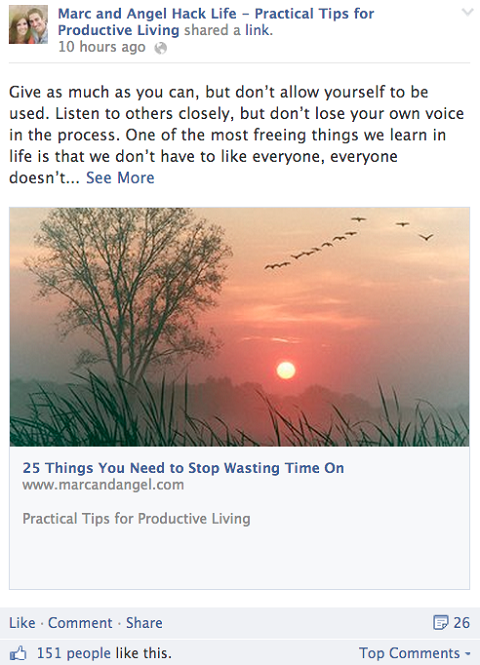 When you share your latest blog post on Facebook, you want your fans to click through and read it on your website. Read on to find out how to entice your social media fans and followers to click through to your website where you can create a deeper connection with them. Most businesses make the same mistake in their social media updates: They don’thave a call to action that routes people back to their website. 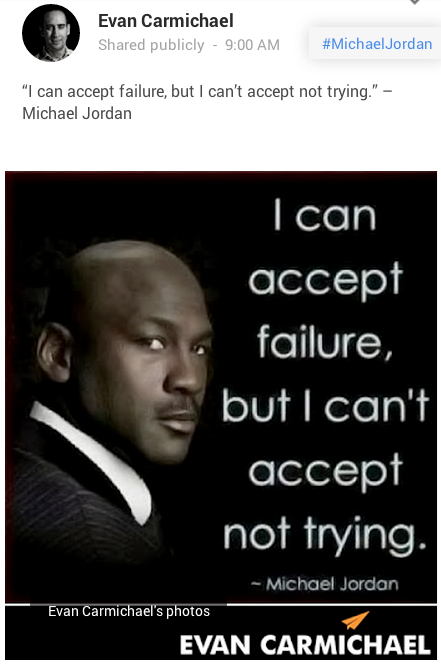 In the example below, Evan Carmichael (a friend of mine), shared an image and quote from Michael Jordan. Branding images you share is a great first step to expanding your reach. I love that Evan put his logo on the image, because when the image is shared, people see the logo and it’s more exposure for him. Unfortunately, it won’t drive traffic to his site. In the future, Evan can leverage his sharable images to drive traffic by including a link (within the update, on the image or both) to related content on his site. 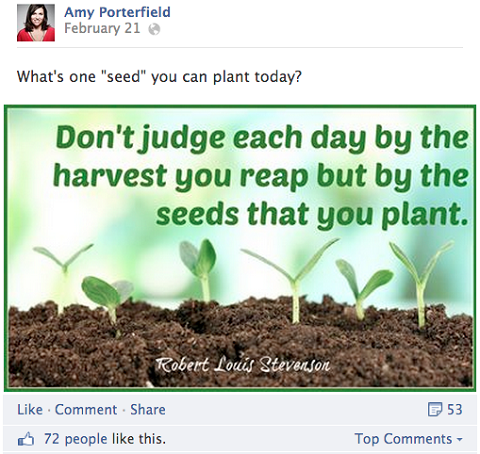 Amy Porterfield is another friend that is uber-smart and uses Facebook wisely. You can see in the example below that the quote she shared was liked 72 times and shared 53 times (at the time of this writing). 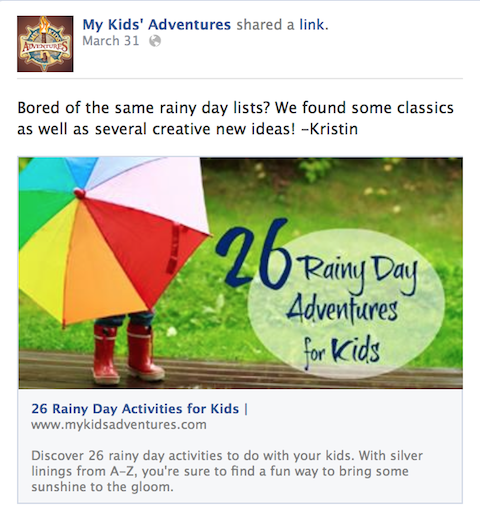 Think about how you can use shareable content to get interaction on both your social update andyour website. While Amy is sharing a great quote and status update that encourages interaction on Facebook, the lack of branding and no link back to her site hurts her click-through rate. To encourage people to interact both on Facebook and her website, she could ask the same question, but include a link back to a post that helps people brainstorm ideas or start a new project. That could be a nice boost in website traffic. If she put her logo on the image, as Evan did, she’d also get more exposure when it’s shared. Every piece of content you create should be used to help you deepen the connection with the people you engage with on social media. You can do that by writing and sharing smart stuff on your website that solves a pain point and leads your audience to the next step. If people like what they read, then they may sign up for your email list or even consider buying something from you. Marc and Angel are brilliant at using Facebook to drive traffic to their personal development blog; it’s usually their #2 traffic source each month. Below you can see how they promote their audio book and entice their fans to visit their site. This kind of promotion and call to action can lead to big sales! A smart mix of interesting text, an attractive image, a call to action and a link can drive a lot of traffic to your site. So far I’ve given Facebook examples, but LinkedIn is also a great place to drive traffic to your website. In the update below, Andrea Vahl created a strong call to action that included urgency. Her message told people what to expect, asked them to act quickly and included a link to her sales page. 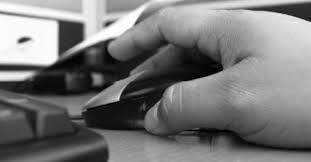 Include a call to action that gives your readers a reason to click over to your website. It’s great to talk about your own products and services, but if you can get someone else to talk about them, that’s when you’ll see the real power of social media. Fans and followers are more likely to click through when someone they trust suggests they should take notice of something. For example, Jon Morrow tweeted out to his 28,000+ followers that an article at Copyblogger was worth their time (link included of course). Leverage your existing network to create new relationships. When a social influencer gives his audience’s precious attention to you, then you’re one step closer to getting that audience to trust you. As you write and share your social media messages that (you hope) funnel people to your site, think about how all of the parts of the message fit together. If there is even a slight inconsistency, the reader will likely pause, then stop their forward momentum. Ask yourself: Does the headline fit the image? Does the image fit the text? Does your call to action fit your goal, image and text? Does the landing page fit everything that came before it? To get the most out of your efforts, look at which social updates, blog posts and advertising campaigns your prospective customers have responded well to in the past. When you find the underlying connection and craft a similar message that recreates the response, you’ll start to see consistent improvements in your click-through rate. And remember, the way you frame your message has a big impact on your success. 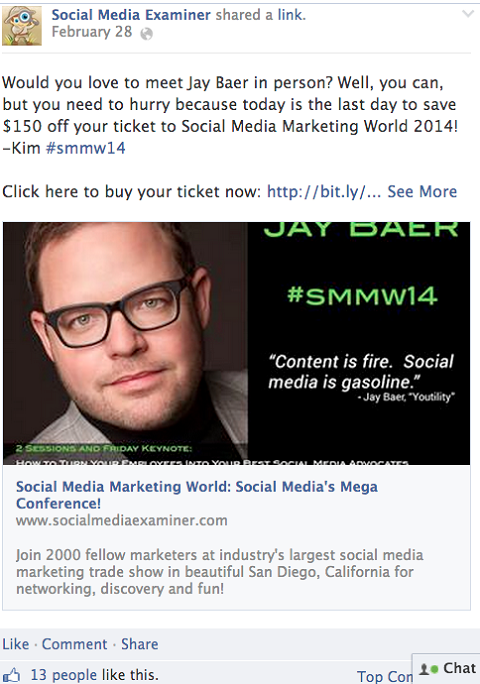 In the weeks leading up to Social Media Marketing World, Social Media Examiner was promoting a sale on tickets to the event. Providing high value is attractive to your fans. The update calls fans’ attention to the high perceived value of the deal: If you buy a discounted ticket, you could meet Jay Baer and other influencers and be one of 2000 marketers at the largest social media marketing trade show. The text, the image, the caption—the whole package—worked together to tempt fans to visit the Social Media Examiner website and buy a ticket to Social Media Marketing World. Now that you have everyone’s attention, what are you going to do with it? Where will your new visitors land when they get to your website? your readers land on a page that gets them excited about what you’re asking them to do. Gary Vaynerchuk knows that a great landing page focuses on the action that you want your visitors to take when they arrive from a social media link. 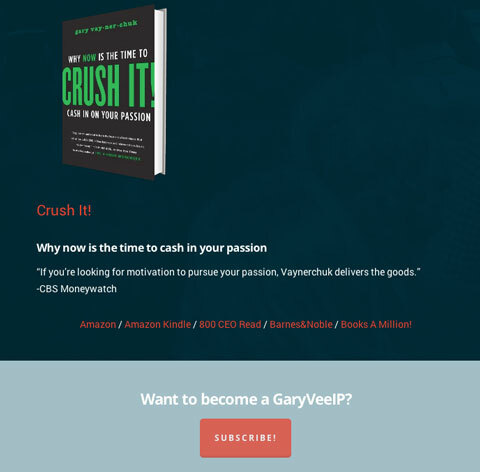 Gary Vaynerchuk’s landing page has several options to let users buy his books, and a call to action to subscribe to his email list. For example, you may want to share a free article with your audience in exchange for their email address. Use your landing page to provide more information and another clear, strong call to action and the means to complete that action. Strong relationships are an important part of conversion. The more value you offer your fans, the more likely they are to click through. With a few tweaks to your social updates, you can draw your fans and followers to your website. Be consistent with your messaging, brand your images, provide a clear call to action and share a link that lets your fans complete that action. You’ll see results in no time.